If you liked the "CounterCulture" Modular set, there's good news for you! the "Chez Moi" (Colonial) set and the "Way Coolinary" (Groovy) set. Let's bring the Maxis furniture to a top-quality level! Now the Trash Compactor has the "Add to Compost" option. The new version is included in the archive "ChezMoiSet_Appliances.rar", attached to this post. 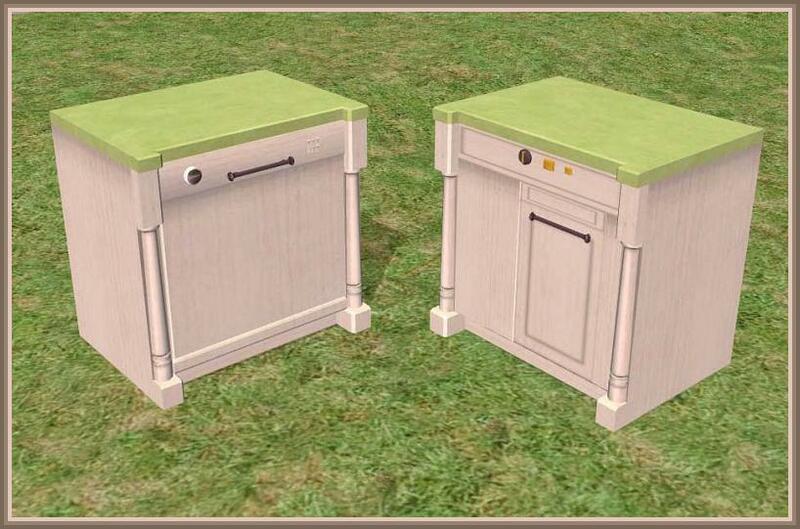 This new version of the Global Mod extends to the Maxis counters a feature already existing in our custom counters: the large appliances installed under the counters will not show the metal sides. Read more details below. Is your kitchen clogged by odd signs reading "Get the Multi-Junction"? You can connect flawlessly counters, islands and bar counters, without ugly "back trims" on the counters, and perfectly pairing the surfaces of the island and the counters. You can create fancy-shaped islands, mixing and matching the new no-trim counters, the connecting island and even the original Maxis counters with back trim. The appliances (trash compactor and dishwasher) are perfectly coordinated with the counters, and are really encased in the counter: no metal panels will be visible! Using our special (optional) "Global Mod", you can also FIX the ugly appearance of the Maxis "Chez Moi" counters and islands (look at the screenshot below, to see the difference!). This will allow you to flawlessly mix our counters and our island with Maxis' ones. The updated version of the Global Mod will hide the metal sides of the large appliances even if you mount them under Maxis counters. In the archive "ChezMoiSet_GLOBAL-MOD.rar": Optional global mod to fix the appearance of the Maxis "Chez Moi" counters and island. Once installed, you will find three more icons in the "Surfaces/Counters" catalog (two counters and one island); two more icons in the "Appliances/Large Appliances" catalog (Trash compactor and Dishwasher). (NOTE: the installation of the "Global Mod" doesn't create any new icon in the catalog). The "no-trim" ChezMoi counters can be used just like any Maxis counter. On the other hand, our "Connecting Island" is different: they will automatically modify their shape to flawlessly connect to adjacent counters (at least two islands are required for this). 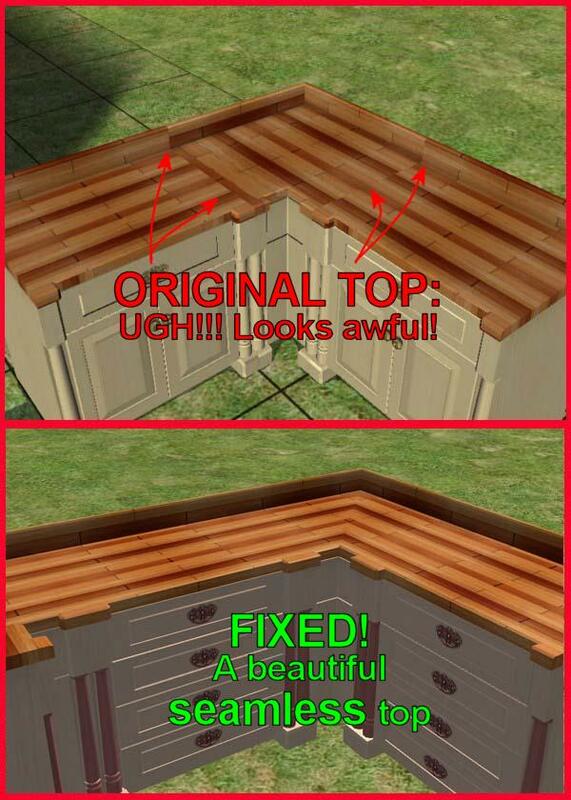 The island is capable of forming corners, but this feature is available only to NL or OFB users: the base game and UNI don't include this feature. 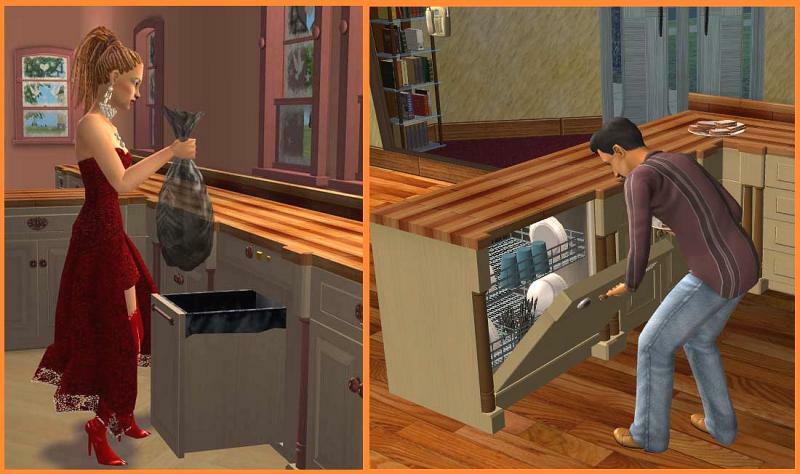 Both the island and the counters allow the sims to prepare meals on them, and get dirty (like all the other counters ). The island corners are usable by the sims: you can put an espresso machine, a mixer, a telephone or whatever on them, and the sims can correctly interact with the objects. The metal sides of the dishwasher are not visible any more, but only if you use our "NoTrim" Counters! If you mount our dishwasher on a Maxis counter, the metal sides will be visible. The new optional GLOBAL MOD will hide the metal sides of the large appliances even if you mount them under Maxis counters. If you have installed the optional Global Mod, the look of the Maxis "Chez Moi" counters and island will be greatly improved, and will better match our Modular Set. The entire "Chez Moi" Modular Set is compatible with any game, from the base game to Pets. The (optional) Global Mod, too, should be put in the Downloads, along with the other packages. The Collections do not contain any object: they are just a list of all the ChezMoi items. Once installed, you can open the collections from the Buy Mode catalog (click on the icon that looks like a folder) and you will find all the existing collections. 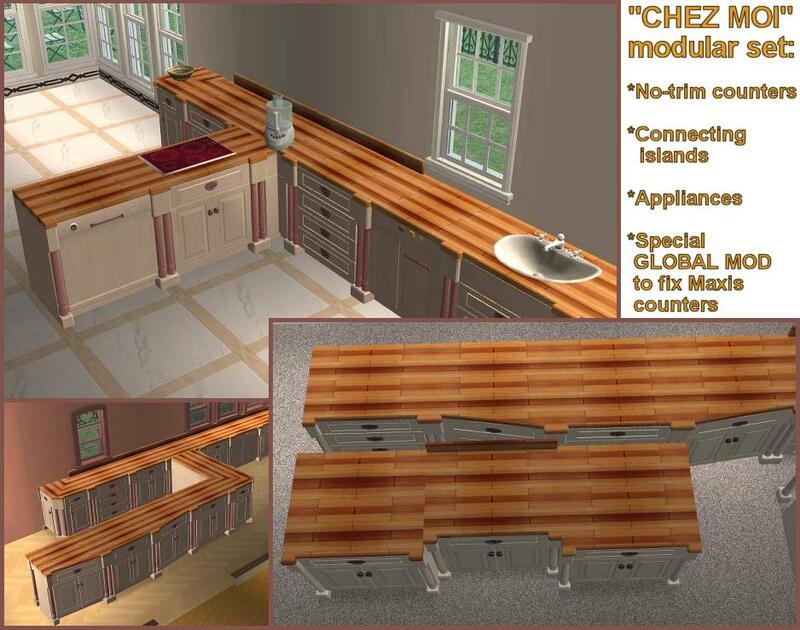 Among them, there is the "ChezMoi Set", that groups together all the ChezMoi items, including the Maxis counters. All the counters, the island and the appliances borrow the textures from the original Maxis "Chez Moi" counter: therefore, if you want to recolour our set, just create a recolour for the Maxis "Chez Moi" counter. On the other hand, every recolour for the Maxis counter that you may already have in your Downloads will be automatically available for the whole "Chez Moi" Modular set. Maxis for the original Chez Moi counters. You can include this set in your lots uploaded to completely free sites (NO EXCHANGE), as long as you grant credits to MaryLou & Numenor and you provide a link to this thread (not just to MTS2! ).